Blown Film Extrusion Line is the best choice for maximum volume and top quality output. Distinctive new screw design with automatic winder for high capacity output and efficiency. Two layer blown film Line has a great demand in global market for its wide range of packaging products that can be produced from it. 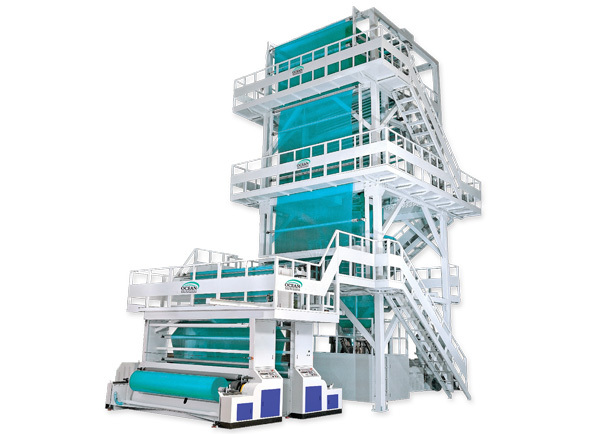 Two layer blown film machine is an economical solution to create moderate barrier films for shopping bags, crop covers, carry bags used in textile sector, etc. It consumers low power and when it www.oceanextrusions.comcomes to return on investment, packaging industry can made good and fast profit. Similarly, two layer blown film line materials can also be produced from this single plant. 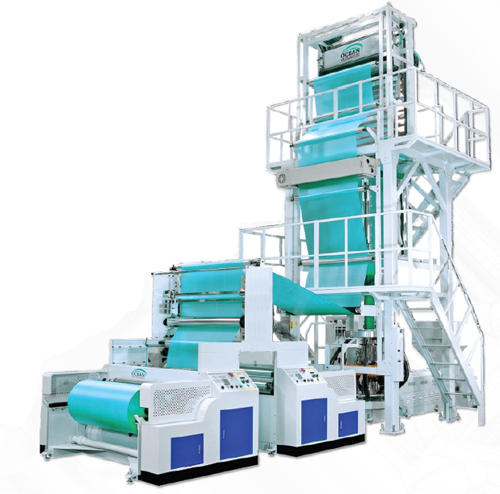 Two Layer Blown Film Extrusion Lines with the best combination of technology and performance. These low investment, power efficient, high – speed plants can give processors the competitive edge and quick return on their investment. Blown Film Extrusion Lines with the best combination of technology and performance. These low investment, power efficient, high – speed plants can give processors the competitive edge and quick return on their investment. provides the blown film industry with the latest in high “value added” technologies. Since 1989, DRJ has established industry standards in internal bubble cooling (IBC) control, width control, and machine direction sealing technologies and continues to develop innovations that make our customers more competitive and more profitable.The quickest way to get to know about us is to view this 4 minute video. It describes our company, our industry and how our products ensure that you add value to your bottom line. Among the different types flexible packaging films available a blown film is one that is made of synthetic ingredients like polyethylene. It is made by a technology called blown extrusion where the film in obtained by processing through a spherical dies. What Features Make Blown Film Special? Blown film or extrusion of blown film is the popular flexible box up film trend preferred in most of the industries. Majority of films made with plastic resins are made with this technology. Blown film plant is a high end option in extrusion machinery. With blown film plant excellent quality of packaging materials can be produced. Ocean Extrusions is a manufacturer of packaging film machinery. With their range of machineries that offer reliable and high quality machinery for more production requirement. Blown film is considered a tremendous invention for smart packaging options. Investing in a blown film plant will certainly bring more and more benefits in terms of making different kinds of synthetic film. Ocean Extrusions is the right place to find the best Blown film plant. Packaging industry is facing equal growth in technological impact. Since, the necessity for export and import is increasing worldwide; high quality packaging techniques are required to maintain the quality, safety and originality of the products that are packed. Be it food industry or medial or machineries or cosmetics for instance, the aspect of packaging has a big role to play. As a result of the increasing demand for different types of packaging and consecutive extrusion machinery, there is also good demand for different types of packaging to be done. Running one of the plastic extruder machineries such as a Blown film plant will suit a range packaging options for several industrial requirements. Hence, manufacturing blown films offers wide opportunity to develop business worldwide. Mono Layer Blown Film Plant-A mono layer blown film machine is a best option to design shopping bags, grocery bags, aluminium foils, lamination film, baked items packaging, green house films, simple carry bags, shrink films, etc. With a mono layer blown film plant it is easy to manufacture from 35kg to 450 kg of films in one hour. You can choose the features such as changeable plastic extrusion output in the machinery depending upon the production requirement. Two Layer Blown Film Plant– If you are looking out for an option where you can get higher productivity at a reasonable investment and quick returns a two layer blown film line plant will stay the right option. Air bubble sheet plant– We can produce air bubble wrap sheets with scratch protection and water resistant. This is a superior option in packaging films. It is applied for packaging shipping industry. In addition with PP HDPE PET Box Strapping Plant you can produce heat-sealing straps and with PP TQ blown film plant you can manufacture packaging for textile and food industry. A Pet reprocess plant involves recycling and fabrication of waste plastics and found to be an economical investment. A Sutli plant is for producing synthetic jute packaging material for small and medium size products whereas, an extrusion coating lamination plant will be the best option to product jumbo bags, aluminium foils, polyester films, etc. Multi-Layer Blown Film Plant- Among the different types of blown film plants and relative plastic extrusion machinery a multilayer blown film plant can stay a best option for co extruder feature. There are advanced features added to multilayer blown film machinery such as the grooved feed barrel, dosing system, rotating die, automatic bubble cage, etc which helps in experiencing high productivity as well as better quality. Packaging for confectionaries, dairy products, fast foods, can be produced in addition to general types of food packaging requirements. 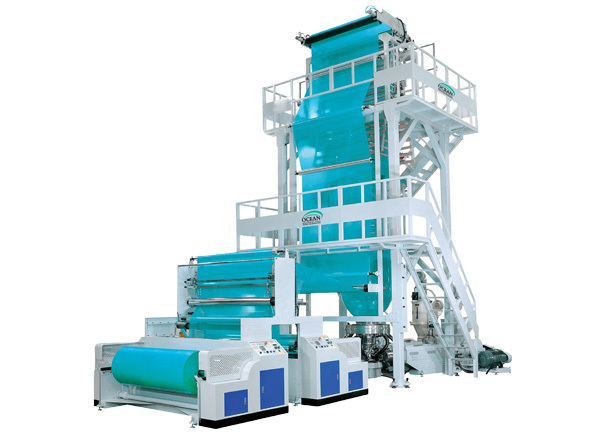 Investing on blown film machineries will stay an ideal choice to make good returns. There are a number of industrial applications for which various blown film plants can stay useful. Starting from food industry to medical, machinery manufacturing, textile, cosmetics, medial equipments, dried foods, processed foods, dairy products, confectionaries, groceries, etc Indian packaging film manufacturers are emerging out with innovative and highly reliable packaging products that are in demand all over the world. Investing on any type of blown film plant in accordance with the type of demand will enhance your revenues as well. Choosing a blown film plant is an ideal investment, but buying a high quality and reliable machinery is more important. Plastic extrusion process is well defined from ancient period. The concept is to generate the required plastic product from raw plastic material. The process seem easy is not as easy. It requires extrusion machinery to melt plastic granules or raw materials at certain high temperature like 200 centigrade along with the soluble materials to melt down the raw granules. The granules are heated and molt down in the heating extruder cavity which is operating and controlled at certain heating temperature. On completing the melting process, the liquid plastic is forced to the die by screw pressure method. This melted plastic is cooled in die to define particle shape for the product. There are various extrusion machineries applied in industries like blown film plant, extrusion coating lamination plant, raffia tape stretching plant, PP box strapping plant, PET box strapping plant, PP/ HDPE monofilament plant, sutli plant, reprocess plant, PP-TQ blown film plant etc. Each machinery contains plastic extruder for extrusion process. Mono layer blown film lines are offered in tailor made configurations to process diverse range of customized monolayer blown film lines – HM, HDPE, LDPE, LLDPE to suit a customer’s specific requirement to produce a wide variety of films for mono layer application. Monolayer blown film line is ideal for shopping bags. Grocery bags, Liners, Sheet, Lamination film for aluminum foil, Detergent packing, Salt packing, Bread packing Confectionery, Dairy products packing, Textiles, Garments Hosiery, Fast food packing, Green house film etc. Multilayer blown film plant incorporate most advanced features like grooved feed sections, barrier screws, oscillating platform, stackable die, internal bubble cooling, automatic bubble cage, fully automatic surface winder etc. applicable best to the packaging film like Milk packaging film, Oil packaging film, Stretch film, Lamination film along with other packaging industries like Medical and pharmaceutical packaging, Textile and Garments Packaging etc. Two layers blown film line of extrusion utilizes two or more extruders to melt and deliver a steady volumetric throughput of different viscous plastics to a single extrusion head which will extrude the materials in the desired form. Egg. In the vinyl fencing industry, where co-extrusion is used by blown film line to tailor the layers based on whether they are exposed to the weather or not.